Important: Jama Analyze supports Jira and Jira Service Desk cloud and self-hosted accounts. If you are self-hosting Jira, contact Jama Software support to set up the integration. Open the Jira integration page. 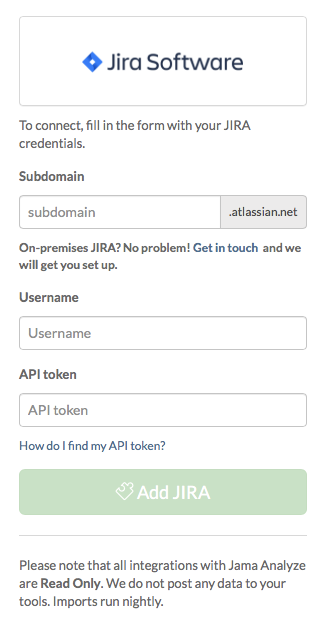 If you are using a hosted instance of Jira, enter your username and your API token. 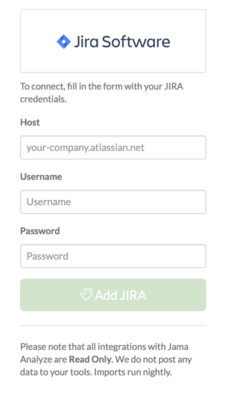 If you are using an on-premises instance of Jira, enter your username and password. Select the green Add Jira button. Tip: To edit your Jira project settings, open the Jira integration page and select Configure from the tool bar in the top right. Now that Jira is integrated with Analyze, you can build metrics with Jira data. Note: If your team currently uses single sign on with Google or another SSO service, you will need to have an administrator in your Jira account create a new user with access to the desired projects outside of the SSO in order to access Jama Analyze.